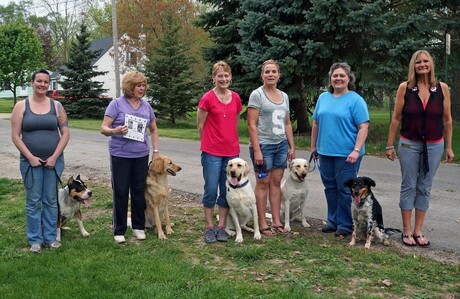 Lisa Freeman is a top Dog Trainer in Michigan (serving: Flint, Lansing, St. John's Saginaw, Elsie, Ovid, Clio, Owosso, Corunna, Bancroft, Durand, Chesaning, Highland, Midland, Bay City, Mt. Morris, DeWitt, East Lansing, Okemos, Perry, Williamston, Howell, Jackson, Ann Arbor, Highland, Davison, Detroit, Troy, Novi, Waterford, and more) AKA as the Dog Whisperer in her community. She has been featured on ABC, CBS, NBC and other TV news stations. She specializes in behavior modification while teaching dog owners how to train a puppy or how to train a dog for dog obedience. She offers AKC Star Puppy Classes, Canine Good Citizen Classes, Pet Therapy Dog Classes, Agility Courses, and Service Dog Training. She is an AKC Evaluator and Certified Pet Therapist with over fourteen years of experience in dog training, and has three therapy dogs of her own. She works with dog lovers, dog trainers, and dog owners daily on aggressive and unwanted behaviors. Pet Therapy & Obedience Training are typically taught in 4-6 week sessions. Private and Group classes available. *Canine Good Citizen and Therapy Dog Testing sessions are offered monthly on an as needed basis. In these fun, upbeat, interactive six week classes, dog owners will learn how to train a puppy, or how to train a dog using both basic and advanced methods, depending on level of knowledge and skill. Dogs and pups will master all the basics in obedience (come, sit, stay, and down) as well as more advanced training (leave it, stand, walking on a loose leash/ and heeling) and even pet therapy methods (staying with a safe stranger for 3 minutes, distractions to other dogs, staying from a distance). *Dog handlers will also learn important tips and techniques to train a dog or puppy to break bad behaviors such as: barking, biting, mouthing, jumping, etc. Each participant and dog will receive a nice certificate upon completion of the class. *Limit of 10 Handlers & Dogs per class. All classes and students are on a First Come First Serve basis. Pre-registration and payment are required. 100% Money Back Guarantee!